IGCAR recently published IGCAR Syllabus 2019 for the vacancies of Technical Officer, Scientific Assistant, Stipendiary Trainee Category-I, Technician, Stipendiary Trainee Category-II and Administrative Posts. For these posts, the officials released the IGCAR Exam pattern & Syllabus for the candidates. So, candidates check and download pdf of the igcar.gov.in Stipendiary Trainee Exam syllabus and exam pattern through the online web page @ igcar.gov.in. IGCAR Stipendiary Trainee Syllabus 2019 announced recently by the officials of Indira Gandhi Center for Atomic Research. This is the notification of IGCAR Recruitment for 248 posts in several categories. The major posts of this notification are for the Stipendiary Trainee Category-II posts of 114 Vacant positions. For these posts, the officials released the IGCAR Syllabus for Stipendiary Trainee Category I, for the preparation of candidates who are applied for this recruitment notification. The aspirants may get the IGCAR Stipendiary Trainee Syllabus download links through the online on our page @recruitmentindia.in where they move on the preparation. Those who referred to the IGCAR Scientific Assistant Syllabus, they may qualify the job easily. IGCAR Technical Officer Exam Syllabus & Exam Pattern is available now on our page. A few days ago the Indira Gandhi Center for Atomic Research released a notification for the unemployed candidates for Technical Officer, Scientific Assistant, Stipendiary Trainee Category-I, Technician, Stipendiary Trainee Category-II and Administrative Posts. For this recruitment, the Candidates will be shortlisted by the Officials through the written test and final interview. For the written test the officials released the IGCAR Stipendiary Trainee Exam Syllabus And exam pattern for the Sake of candidates. Those must be prepared by the contenders till they get knowledge for qualifying the exam easily. And also get the Latest Tamil Nadu Govt job Updates here. 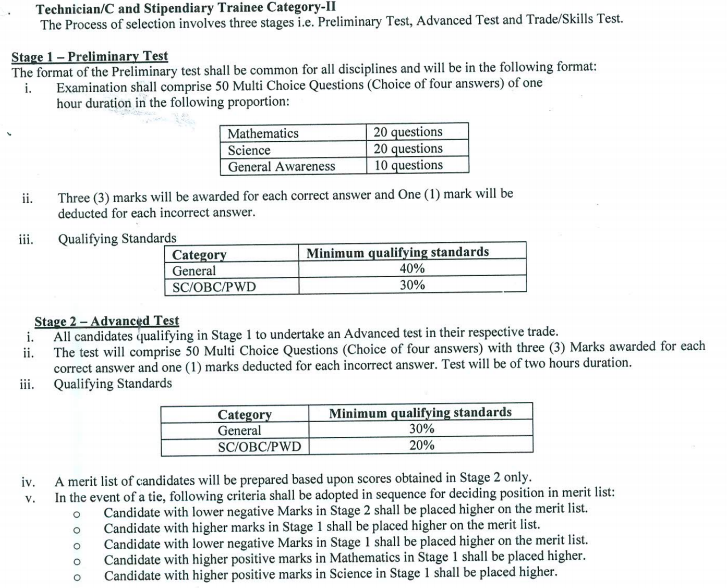 IGCAR Stipendiary Trainee Exam Pattern: Here we gave the IGCAR Stipendiary Trainee Category I Syllabus & exam pattern for the aspirants on the below table of this page. the table consists of the four classifications they are Type of questions, subject names, total questions, Total Marks and also Exam Duration. For every job designation, different subjects are there and the IGCAR exam duration is similar to all designations. For the posts of IGCAR Technical Officer Exam Pattern have, the total number of questions are 75 and each question carries 3 marks totally the examination conducted for this Technical officer post is 225 marks. for the posts of Scientific Assistant, the total number of questions asked by the officials in the written exam is 100 and each question carries 3 marks, totally the written examination conducted for this scientific officer posts is 300 marks. Check out the IGCAR Technician Syllabus @ igcar.gov.in. Similarly, for the posts of Stipendiary Trainee, the total number of questions asked by the officials in the written exam is 50 questions each question carries 3 marks, totally the examination is conducted for this Stipendiary Trainee posts is 150 marks. And also for the posts of Administrative the total number of questions asked by the officials in the written exam is 100 questions each question carries 1 mark, totally the examination is conducted for this Stipendiary Trainee posts is 100 marks. The Aspirants also check the IGCAR Syllabus for the preparation on this below of the page. The IGCAR Syllabus For Stipendiary Trainee Category I consists of General Knowledge, General Intelligence, Aptitude, Reasoning, and computer knowledge. Check Exam Syllabus of IGCAR Stipendiary Trainee which was announced by the officials of Indira Gandhi Center for Atomic Research. The Aspirants who are completed the written examination of the Technical Officer, Scientific Assistant, Stipendiary Trainee Category-I, Technician, Stipendiary Trainee Category-II and Administrative Posts written examination, that candidates get the Results as soon as possible. In the examination the aspirants who have qualified, that contenders get the letter from the conclusive board. Here the ICGAR Exam syllabus has the many categories of subjects and it is very difficult to complete preparation in time. So, the aspirants speed up the downloading process and start the preparation with the placed IGCAR Syllabus. If anyone knows the syllabus and pattern for the category 1/03 Group B.. electrical (diploma)..
How do you know syllabus is correct. When stipendiary trainee category 1 for electricals results will be announced sir?